Last night while I was climbing, the snow began to fall. By the time I left the climbing gym, there were several centimeters of snow on the ground. After climbing, I went downtown to listen to some live jazz music at Glenn Miller Café. 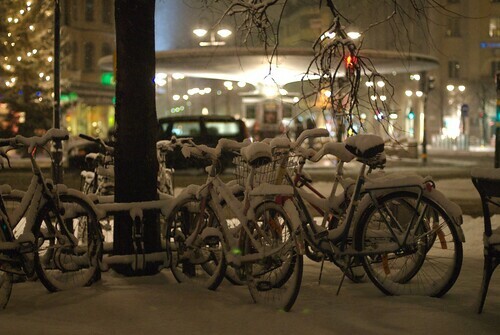 On my way there, I took this photo of snow-covered bicycles with the Stureplan's Christmas tree and famous “mushroom” meeting place in the background.